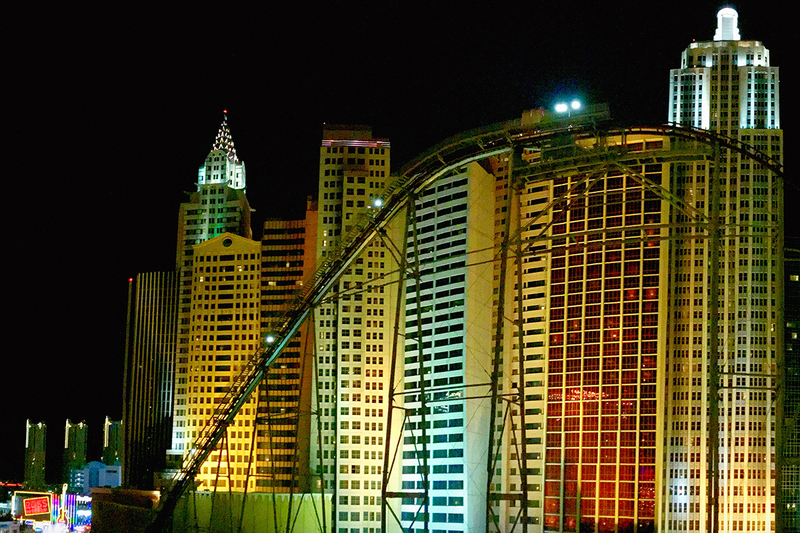 Some of the most underappreciated Vegas photo attractions are – wait for it – parking garages. You probably don’t think there’s much to see in a parking garage, and that’s totally untrue, especially if you’ve ever watched a Vegas episode of “COPS.” JK. The rooftops are actually great places to take pretty and unique photos of the Las Vegas Strip. But there’s a catch – you’ve got to take your pictures before the bike cops find you and kick you out for “loitering” (highly subjective, we know), so consider yourself warned. Happy snapping. The Bellagio’s parking garage. Photo taken with an iPhone 6 Plus by Ashley Oñoz-Wright/Vegas.com. One of our favorites for obvious reasons. The Bellagio’s parking garage is a lot lower than others on Las Vegas Boulevard, and that makes for a completely different angle. It also doesn’t hurt that this is arguably the most photogenic section of the Strip with the Eiffel Tower, Bellagio fountains and the High Roller all visible within the same frame. Good to know: Each year, the trees on the property get bigger and bigger; beautiful for guests but a little inconvenient for parking garage photogs like us. They’re starting to obstruct the view of the fountains and hot air balloon at the Paris Las Vegas, but so far it’s nothing a selfie stick can’t fix. Don’t forget to time your photos with the fountain show schedule. Encore’s parking garage. 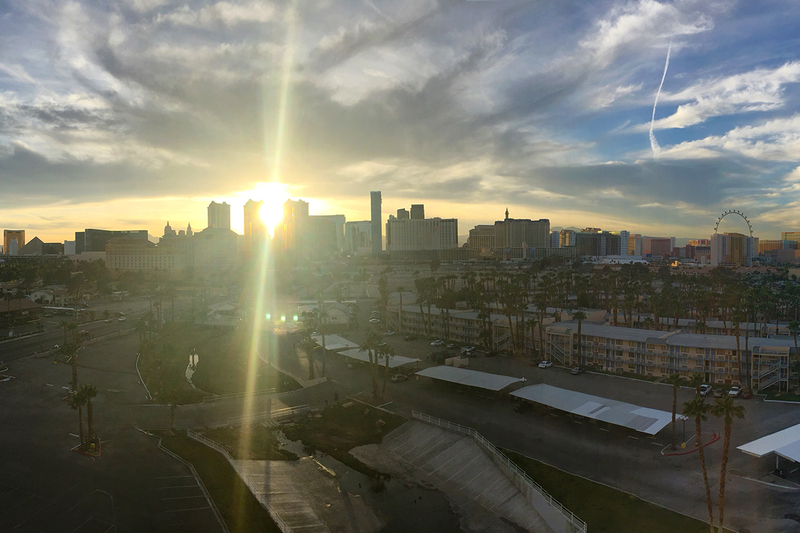 Photo taken with an iPhone 6 Plus by Ashley Oñoz-Wright/Vegas.com. 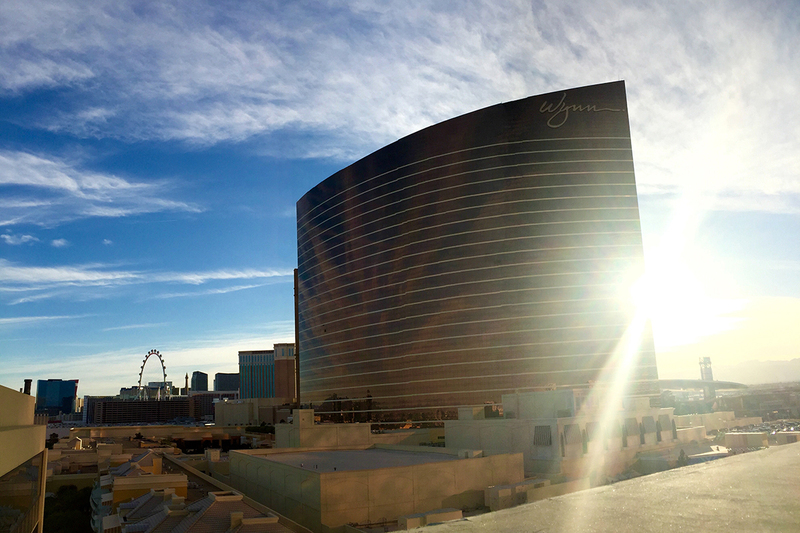 The cool thing about the Encore’s parking garage is that one, they play really snazzy music and two, they have great views of the Wynn, its plush 18-hole golf course and the High Roller. If your windows are down when you drive onto the property, you’ll be smacked in the face with the most glorious floral fragrances. For a second, you completely forget you’re in the sand box we lovingly call Sin City. Good to know: If you go at sunset, there can be some major shadows to contend with on the golf course but the Wynn will be illuminated in all its copper glory. You should also know the duct work on the building isn’t super gorgeous but if you go at night, it disappears. BOOM, problem solved. The Hard Rock Hotel’s parking garage. 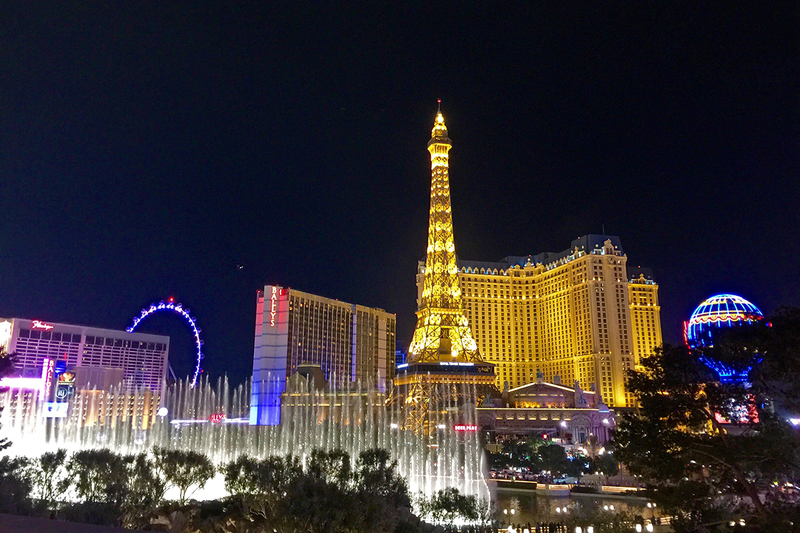 Photo taken with an iPhone 6 Plus by Ashley Oñoz-Wright/Vegas.com. Get ready for some two-for-one awesomeness because this property has two garages, and they’ve both got stellar views. We’re a little sweeter on the Harmon Avenue side just because the Paradise Tower obstructs a complete Strip view. But (and this is a big but), it’s hard to argue that a photo spanning from the MGM Grand all the way to the Wynn isn’t good enough. First world problems, right? Good to know: You may get an unobstructed view of the Strip on the Harmon side, but you’re also going to see the big dirt lot in front of the garage. Of course, if you’re shooting at night it won’t matter. Just a heads up, the Hard Rock is the grand daddy of locations for firework photos above the Vegas skyline. We’re talking stupid good shots, so get here early on New Year’s Eve and the Fourth of July. The Flamingo’s parking garage. Photo taken with an iPhone 6 Plus by Ashley Oñoz-Wright/Vegas.com. Sure, you may not find a great Strip view from this side of the property, but you’ll still get a pretty unique shot. The lush gardens and palm trees around the Flamingo pool with the LINQ Promenade cityscape is a cool contrast and totally photo-worthy. 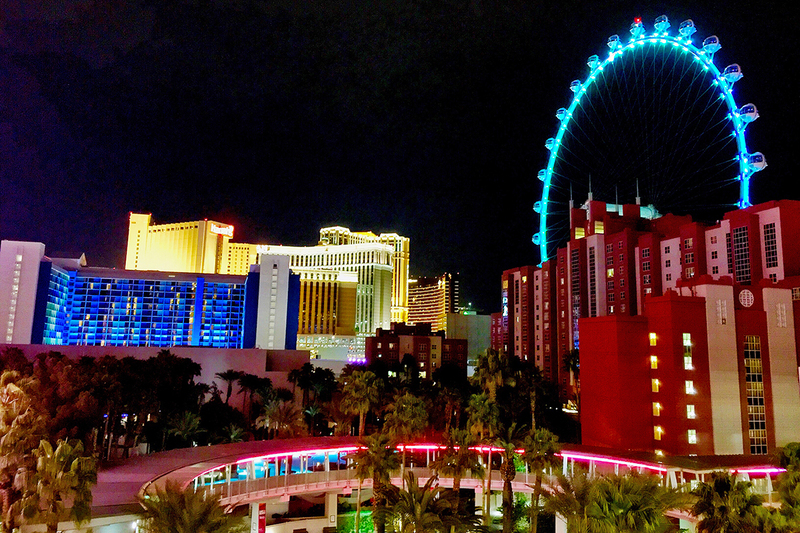 People don’t normally see The LINQ or High Roller from this angle so take advantage of the rarity. Good to know: Since this is an older property, the garage itself is dark and has some tight corners to maneuver. Prepare to leave your giant dually trucks outside because you’ll never squeeze through the garage without taking someone else out. The sky walk leading to the Flamingo Hotel and Las Vegas Monorail is a great place to take pictures of the tropical 15-acre pool and waterfalls. The NY-NY parking garage. Photo taken with an iPhone 6 Plus by Ashley Oñoz-Wright/Vegas.com. The NYNY has a cool partial view of the Strip. But really, the focal point here is the towering faux skyline and the Big Apple Roller Coaster. This is the only location you can capture them both together so it’s worth making the trek to the top of the garage. The coaster car is modeled after a yellow taxi cab, and at night has working headlights. If you take a panoramic photo or use a wide angle lens, you can probably squeeze in the Monte Carlo and some of the Excalibur too. Good to know: It’s a little dark between the Monte Carlo and New York-New York so it’ll leave you with a black hole if you do take that panoramic shot. Unfortunately, you’ll get some gnarly scaffolding in the frame which is obviously less than photogenic. It’s also too bad the roller coaster track isn’t lit because it would be a much cooler shot. Yes it may be expensive for them, but totally worth it for the rest of us. The Rio parking garage. Photo taken with an iPhone 6 Plus by Ashley Oñoz-Wright/Vegas.com. 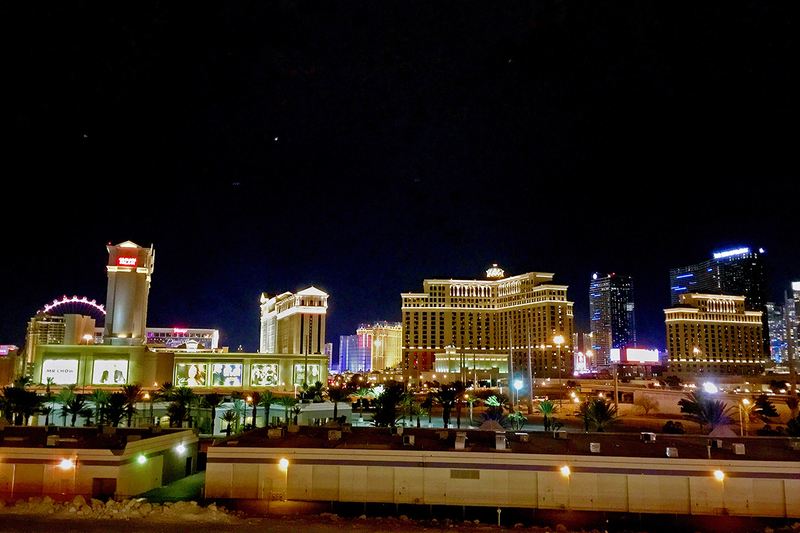 While the Voodoo Rooftop Nightclub is one of our favorite places to view the Strip, the Rio’s parking garage is a lot lower and makes you feel closer to the action. You can easily get a shot of the entire resort corridor on Las Vegas Boulevard, and still show the scale of these massive hotels. When you’re up too high, each property looks like a tiny dot and can kind of feel much less impressive. Go to the Rio garage at night when you can get all the glittery, glamoury goodness of the neon lights. Good to know: A major interstate and a super scary-looking railroad track stand between you and Las Vegas Boulevard. There may be some questionable characters (even by our standards) that roam the area at night so we’d advise you to leave the exploring for the daylight hours. Actually, scratch that. Don’t go wandering around off property – period. Not that you have time to screw around anyway, we’re running from security, remember? No loitering you rule breakers! Did we miss your favorite vantage point? Add it in the comments section below. See more things to do in Vegas.